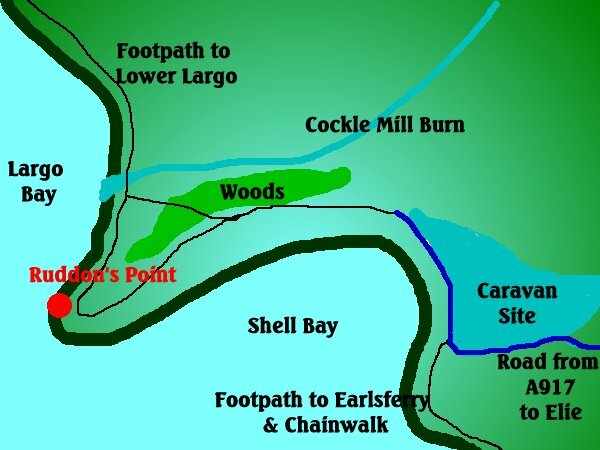 Ruddon's Point is a rocky piece of land that sticks out into the Firth of Forth between Lower Largo and Shell bay Caravan park. To get there from the west,which is through Kirkcaldy and Leven,follow the coast road through Upper Largo.Keep to the main road,go through a small hamlet signposted Drumeldrie,and about 2 miles out of Upper Largo,there is a turn-of to your right for Elie.It's well signposted and there is only the one turn-off to the right on this road. (although be warned it's on a corner and comes on you a bit quick)Take the Elie road,and about 2 miles down this road,there is a crossroads which has the turn-off you're looking for to your right.Again,it's well signposted and well marked for Shell Bay. This small road takes you right down to the caravan site where you can park.You should nip in to the reception here and get a day parking ticket which costs only £1.The various marks in this area are all easily accessible by foot from the caravan park. You can fish anywhere along the seashore from the mouth of the Cocklemill Burn right out to the very point.Take the footpath from the end of the site as shown on the map.The fishing here is very varied with good numbers of Sea Trout attracted by the burn showing up from March right through the summer to October.Spinning silver spinners and freelining sandeels are the best methods. 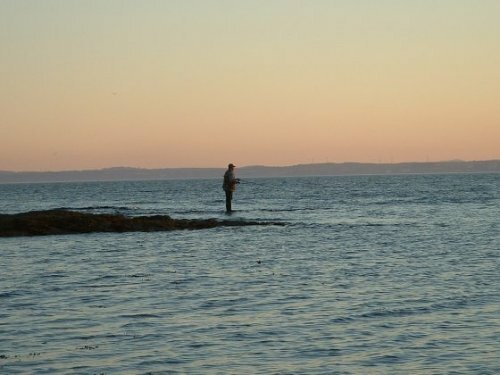 By casting out into Largo Bay you should see decent flounders,coleys,and mackerel in the summer.Ground here is 99% sand and can be fished light. From the point you'll still have chances of all the above mentioned species but with an occassional codling and dogfish thrown in.The ground here is still mainly clear,but with some rocky and weedy patches,but not too many.Winter time will see more chance of cod and pollack,but beware as the camp gates are closed at 4pm from October to March.There is a car park outside the camp gate,but adds a good 1/2 mile to your walk. Sea Trout spinning at Ruddon's Point.